Yesterday we reported that Auxo for iPad was released and this morning I dove into the tweak to actually review it and see whether or not it can live up to the reputation of its older brother on the iPhone and iPod Touch. Auxo for iPad is just how you would expect it to be. It works and functions the almost entirely the same as Auxo. You have the app preview cards that take the place of the default app icons that usually appear in the multitasking tray and the same gestures for dismissing applications. This includes tap and hold to clear the multitasking tray and a swipe down to clear just one application. One thing you will notice on Auxo for the iPad though is that the app preview cards allow you to see more of the app’s state due to the fact there is more screen space. A swipe over to the right reveals the Music Controls and Toggles page. 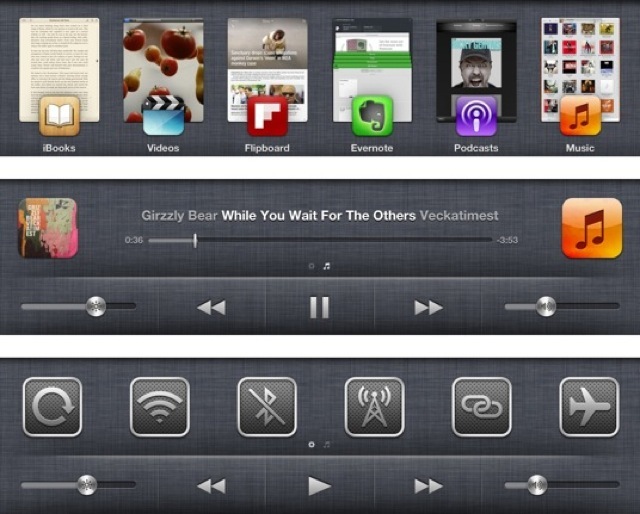 Unlike the iPhone version of Auxo, Auxo for iPad combines both the music controls and toggles are on one page. Swiping right on the music controls reveals the toggles like you would expect. Underneath the toggles and music controls there is the brightness slider and volume slider you have come to expect from Auxo. As for Auxo for iPad’s settings they are pretty self explanatory. In the configuration panel you can toggle whether or not you want to display the toggles over the music controls, when this is enabled you can set up a rule to show the music controls if media is player, and then you can play around with the order and what kinds of toggles you want. Adding more toggles will allow you to swipe down to reveal more. Other than that the last thing you can do is configure how many toggles there are per row. In the prompt options tab there are Settings to do with various features of Auxo for iPad, with one standout being the ability to set specific ask prompts for applications you don’t want to dismiss by accident. I have played around with Auxo for iPad quite a bit and was a little bit disappointed with its stability, but I don’t have any doubts this will dramatically improve over the coming weeks. Regardless of some initial stability issues it is a huge improvement over the stock multitasking experience and will improve your productivity. If you are interested in Auxo for iPad it costs $1.99 through the BigBoss repo and YES even if you own Auxo you will still need to pay for the iPad version. Let us know what you think of the tweak in the comments section below and be sure to watch our video review.